Did you know Roswell, Georgia is one of the newest up and coming foodie destinations? With over 200 independent restaurants ––let's not even worry about the other 100 or so chains––on Canton Street alone, it might be hard to choose where to dine. But, hey, we're in the South and what's more southern than fried chicken? That makes the choice easier. Gotta be Table & Main. 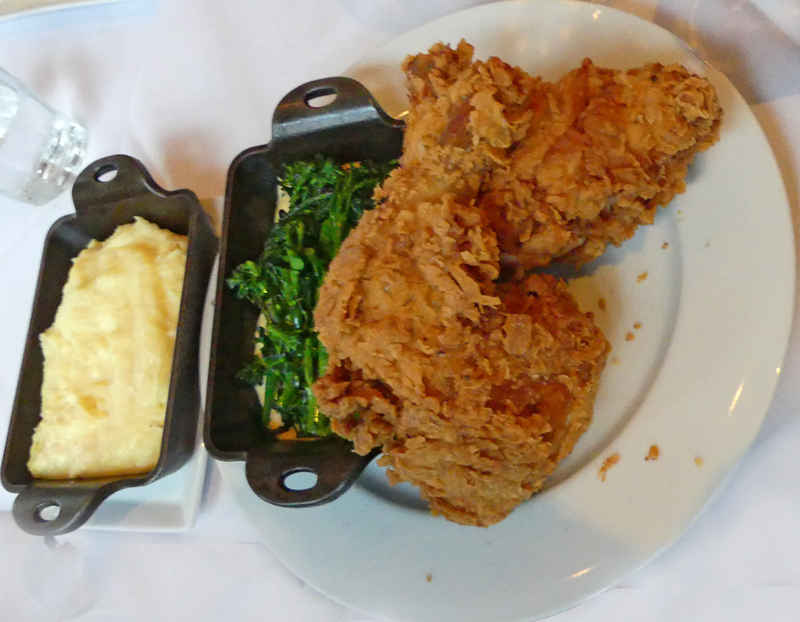 Eater Atlanta readers voted it as number 1 for fried chicken saying "Table & Main offers huge, crispy portions with classic Southern sides like potato salad, collard greens, and fried green tomatoes." They also awarded them the title of "best outdoor patio." Not surprising, Table and Main is ranked number 2 on Zagat's list of best places to eat in Roswell. The only restaurant to outrank them is Osteria Mattone, an Italian bistro owned by the same man, Ryan Pernice. It is a small bungalow that was once a home. The outside patio is beautiful and deserved its accolades. It was a little chilly so we opted for inside but Ryan told us, "In a few weeks, all the greenery and flowers will be out in full bloom." Ryan knows his way around the restaurant business. He's from Roswell and learned from the ground up beginning working in a restaurant at age 13. After graduating from Cornell University's School of Hotel Administration he dabbled mainly in restaurant work. When he learned of a building becoming available on Canton Street in Roswell's Historic District, he jumped in with two feet. The result was Table and Main which he opened in August 2011. He later opened two other restaurants in Roswell. When asked about the success, he credits it in large part to "the very talented, dedicated people on our team that have stayed loyal over the years." One of those people is Executive Chef Woolery "Woody" Back who runs the kitchen at Table and Main. He's a culinary arts graduate from Johnson & Wales University who is originally from Kentucky but began working in restaurants in New York and worked his way south. 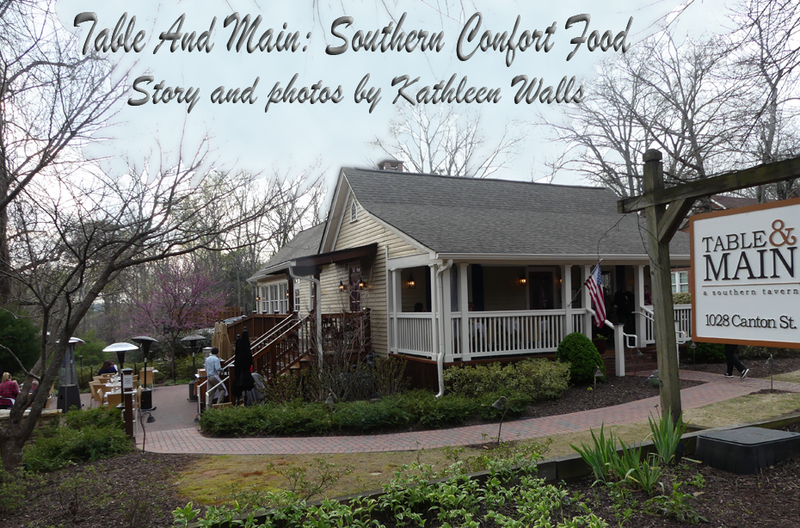 He is a master of not only succulent fried chicken, crispy on the outside and fork tender inside but many other distinctly southern dishes. Taste tempters like Charleston She-Crab Soup or Crab Grits Fritters. The veggies run the southern gamut from collards and field peas to Hoppin' John and those incredible fried green tomatoes. 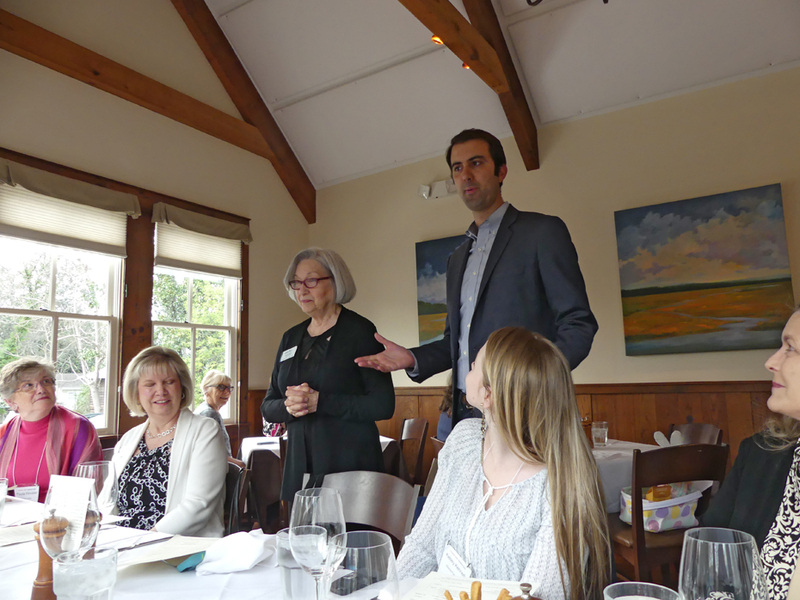 Our waiter, Percy, was very knowledgeable about the dishes. Naturally I had to have the fried chicken and added collard greens and mashed potatoes. The potatoes had a unique touch to them. Along with cream the chef added a bit of chicken broth. Really kicked them up a bit. 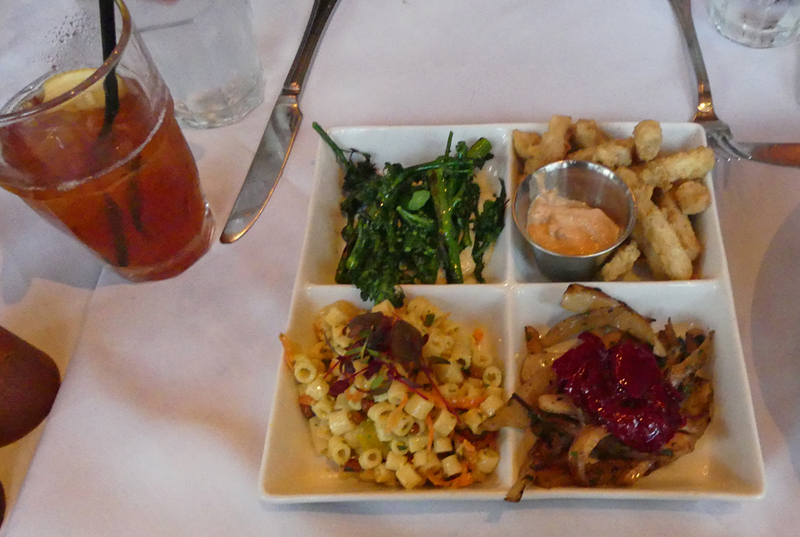 For vegetarian friends, there is a seasonal vegetable plate consisting of four veggies of your choice. One of our group tried it and was quite pleased. We all shared some of the appetizers. 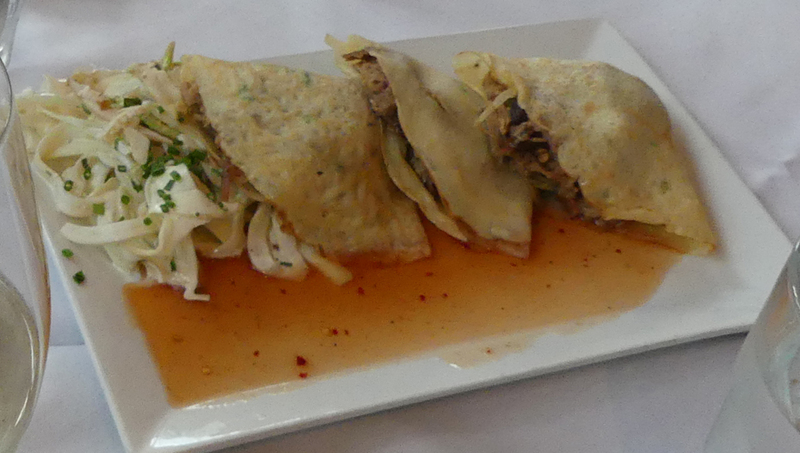 We tried Hogs 'n Quilts which is a bbq pork shoulder wrapped in a chive crepe with home-style slaw and a GA vinegar sauce. 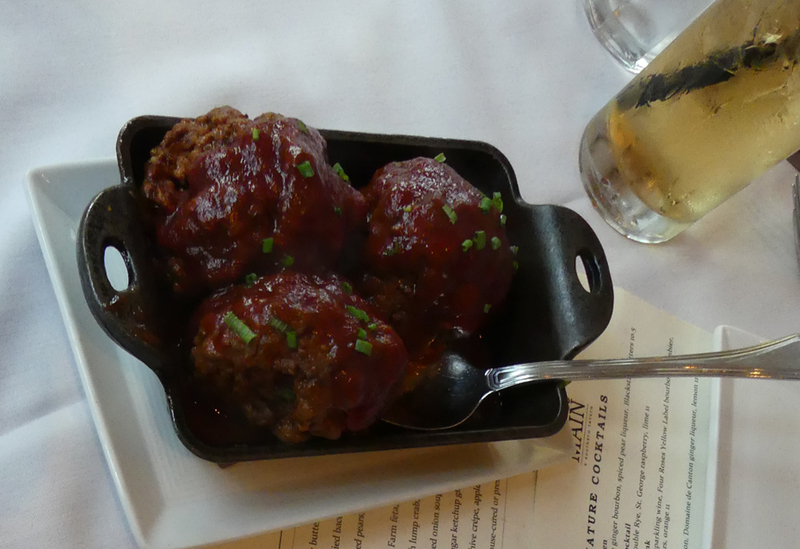 My favorite was the Meatloaf Meatballs. Spicy and sweet and just right. Desserts don't disappoint either. 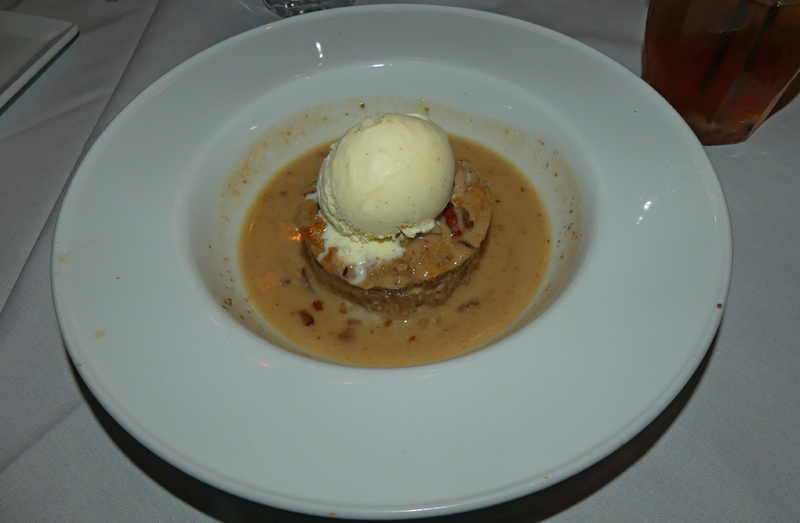 I had their Praline Bread Pudding. The pudding is made with pecans and loaded with praline sauce. They top it with a generous scoop of vanilla bean ice cream for good measure. 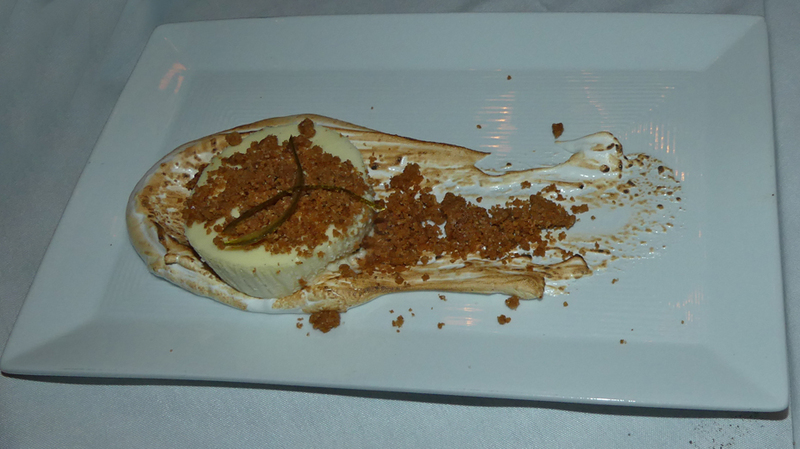 The ones who had the Key Line Cheesecake topped with graham cracker crumbles and a meringue looking fluff didn't complain either.